Friendly Visiting, DOROT’s program that matches volunteers with seniors for weekly visits, creates long-lasting friendships based on mutual interests, which enrich the lives of the older adults and their volunteer visitors. Based on a social work model, DOROT staff provides ongoing support to the volunteer and senior for the duration of their Friendly Visiting relationship. 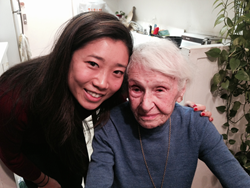 Volunteers commit to visit the same senior every week for a year, however, the average duration of a relationship is three years; 50% of DOROT’s matches have lasted 5 or more years. Our longest match lasted 20 years, and the average age of the elder is 88. Part of our program also includes training for the volunteers on a variety of issues, including a recent program on Elder Abuse Prevention. Laura was carefully matched with Arthur for Friendly Visiting, where they met once a week for over three years and developed a strong bond as they took walks and spent time together at the farmer’s market near Arthur’s apartment. Commenting on the experience, Laura said, “Every time I leave Arthur’s apartment, I feel better than when I walked in, and I know it brightens his world, too. I always say we both volunteer. But maybe I should rephrase that. Neither of us “volunteer” anymore. We’re friends.” Although Laura no longer resides in New York City, but she still regularly speaks to Arthur on the phone. Even if you move, the friendship and the sense of community created by participating in DOROT’s Friendly Visiting program can span miles and last for years. We are currently receiving requests for visitors from seniors. Join us this summer and enhance your life and that of an older neighbor. One hour a week, scheduled at a mutually convenient time, makes a meaningful difference. DOROT, now in its 38th year, brings hundreds of volunteers from all backgrounds to the homes of frail older adults to help dispel their loneliness. DOROT alleviates social isolation among the elderly and provides services to help them live independently as valued members of the community. We serve the Jewish and wider community, bringing the generations together in a mutually beneficial partnership of elders, volunteers and professionals.